Irish cheddar, grilled halloumi, mozzarella, and cream cheese pile onto a patty make for this, the holy union of cheeses. Those who are lactose intolerant may turn to one of BBI’s other beefy masterpieces, like the classic BBQ Burger or El-Gordonita. 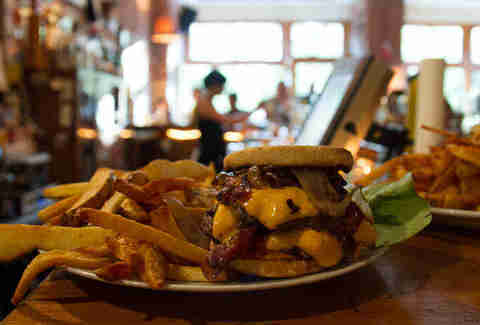 Loaded up with grilled onions, bacon, mustard, and barbecue sauce, the Meisterburger is God’s gift to a hangover. 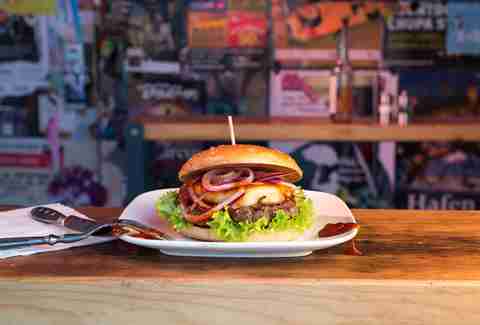 Thankfully, this Berlin institution is open late (3am on weekdays, 4am on the weekends) and serves up juicy burgers with signature cheesy fries right in the heart of Kreuzberg’s bar scene. Fun fact: Burgermeister once was the subway’s public toilet -- but don’t worry, Germany’s sanitation laws are strict. Grilled peppers, jalapeños, and chili sauce make the Spicy Juan just one of many showstoppers on Heroes’ bountiful menu. There are over 30 burgers available, not to mention wacky choices like the Sugar Crush: caramelized onions, peanuts, onions, bacon, tomatoes, and cheese smothered in peanut butter (everything from the bun to the sauce is made in-house, of course). 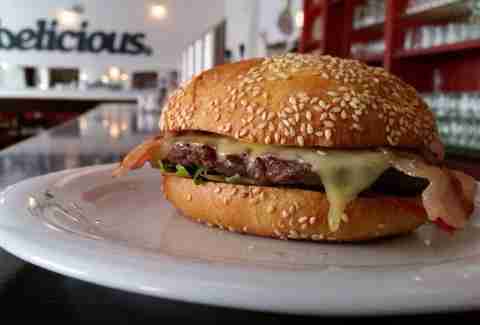 At Belicious, you dress a burger exactly to your liking, including luxe fixings like guacamole, truffle oil, and grilled veggies. The final product is left only to one’s imagination, even the choice of meat, like bison or Wagyu. One thing’s for sure: ending up with a sloppy, satisfactory mess is easy. 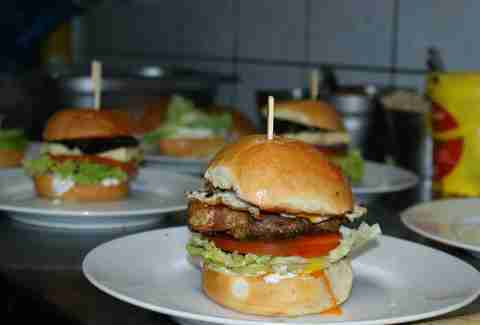 This Vietnamese burger has been crowned the king of Berlin’s “Burgers & Hip Hop” event so many times, it hustled its way onto District Một’s menu for good. With organic beef, pickled veggies, mango, and fish & chili sauce tucked into a pillowy rice flour bao bun, it’s no wonder why. This burger joint in Cologne is proud of its au natural product. All of the beef patties come from Neuland, an association that refuses to plump cows with anything but grass and milk. Stick that organic patty between a soft bun, coated with homemade sauce and fresh trimmings, and you may never be able to eat Burger King again. 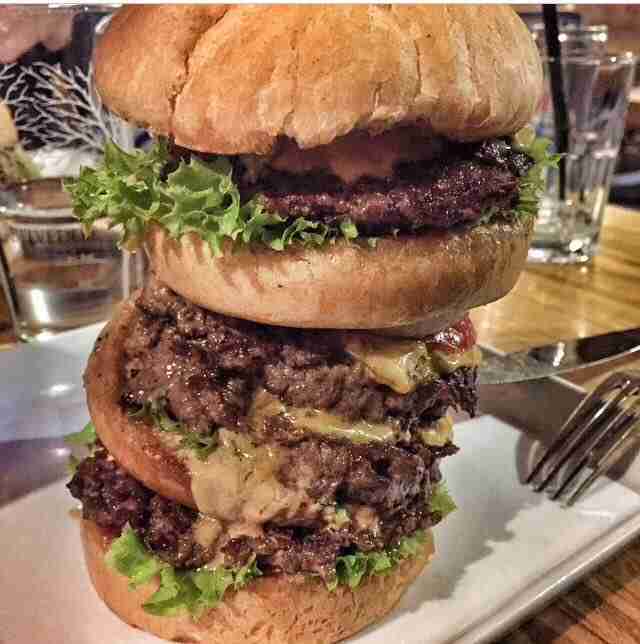 Tell a Burger House employee “It’s Jumbo time” and soon enough, you’ll have this 530g gargantuan before you. 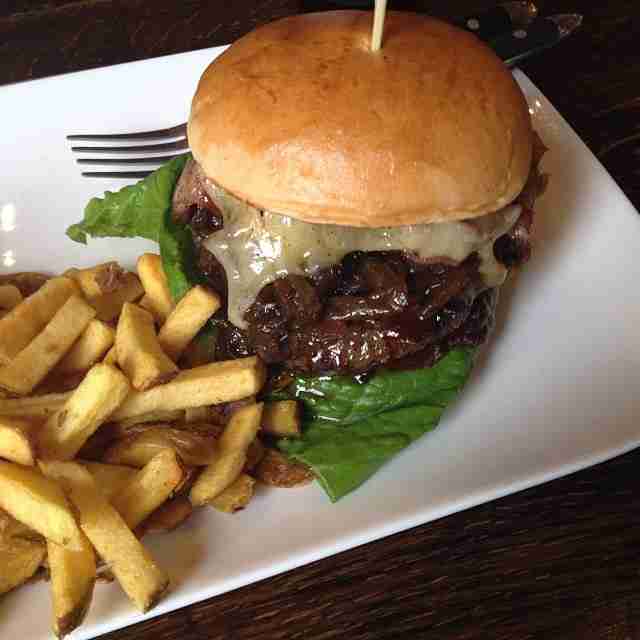 But devouring this bad boy, well, that’s no easy task. If you just can’t handle it, then we’d recommend the "Dreier" instead: your choice of three burgers from the menu in smaller, more manageable form. The Bird’s got a hefty menu, with wild toppings from a fried egg (The Dumb Texan) to Buffalo mozzarella and marinara (The Bronx Bomb). 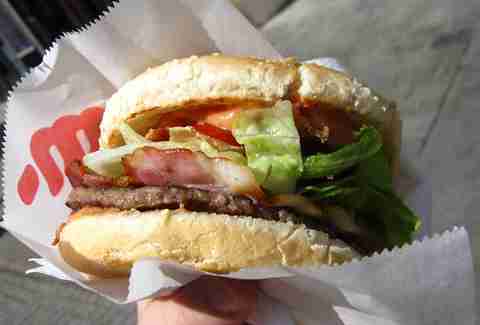 But sometimes, even a burger is not enough to cure a hangover, and that’s when The Drunk Ghetto comes to the rescue. It’s a plain hamburger with onions and a shot of Absolut vodka on the side. You're welcome. 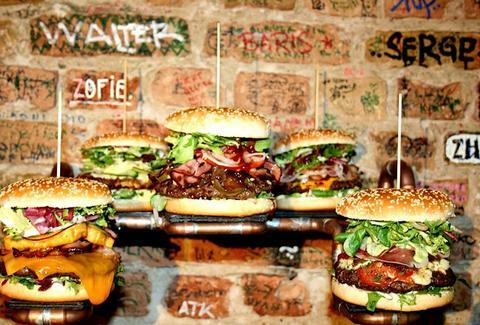 There are only eight burgers on Die Fette Kuh's (The Fat Cow) menu, and quality over quantity prevails here. The Burger of the Week is always a slightly strange, but delicious creation, like the burger made with beef, cheddar, honey ham, pineapple, and coconut mayo on a fluffy bun. A visit to Ban Ban brings the words “burger shack” to mind -- this Korean soul food stand serves only one burger, but the place is quite literally a shack. 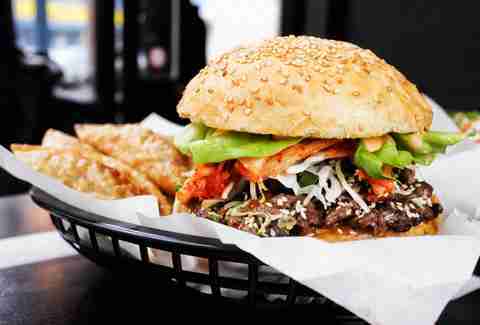 Comfy seating (and seating in general) may be non-existent here, but the Bulgogi Burger brings the crowds out anyway. Savory pieces of Korean-marinated meat topped with kimchi in an American-style bun matches perfectly with kimchi fries and sesame mayo on the side. Meat Us is just the right post-work burger joint. 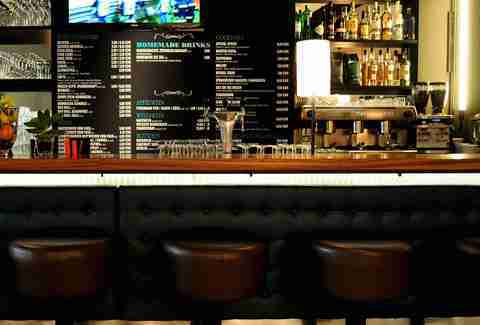 Hop onto a bar stool and design your own burger (or choose from a selection of signatures) and most importantly: have a drink. 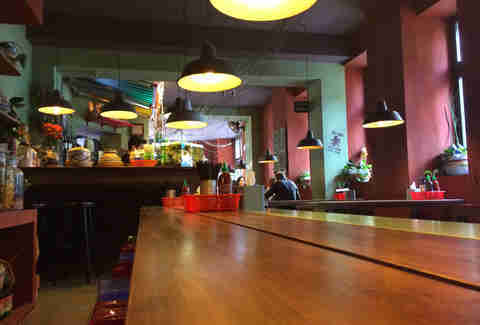 All cocktails, including a wide range of mojitos and margaritas, are only €4.90 until 10pm every day. This little yellow truck is known for popping up at events around Berlin, and churning out juicy Brandenburg beef patties that make a satiating on-the-go snack. 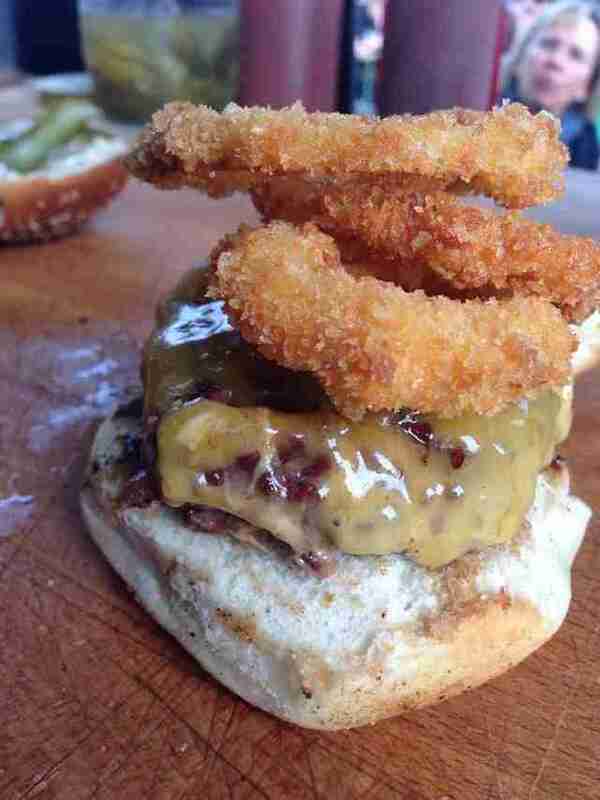 For optimal walking-while-eating action, we recommend the Onion Ring Burger.